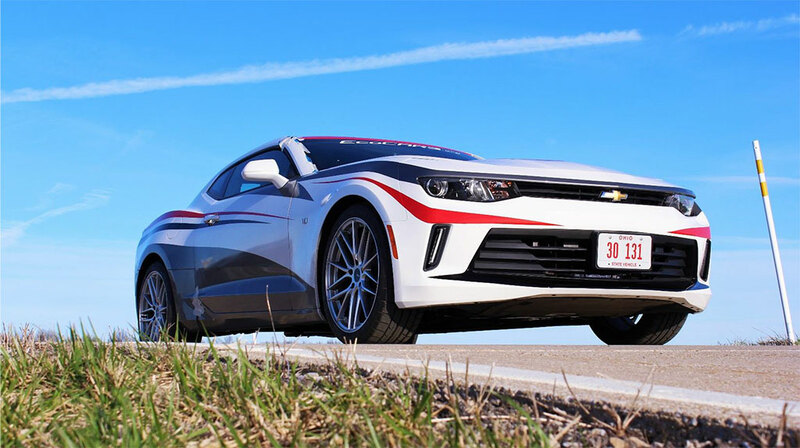 Sixteen universities are challenged to redesign a Chevrolet Camaro by demonstrating emerging automotive technologies, while still maintaining the performance expected from this iconic muscle car. The vehicles are evaluated in a wide range of dynamic and static events. 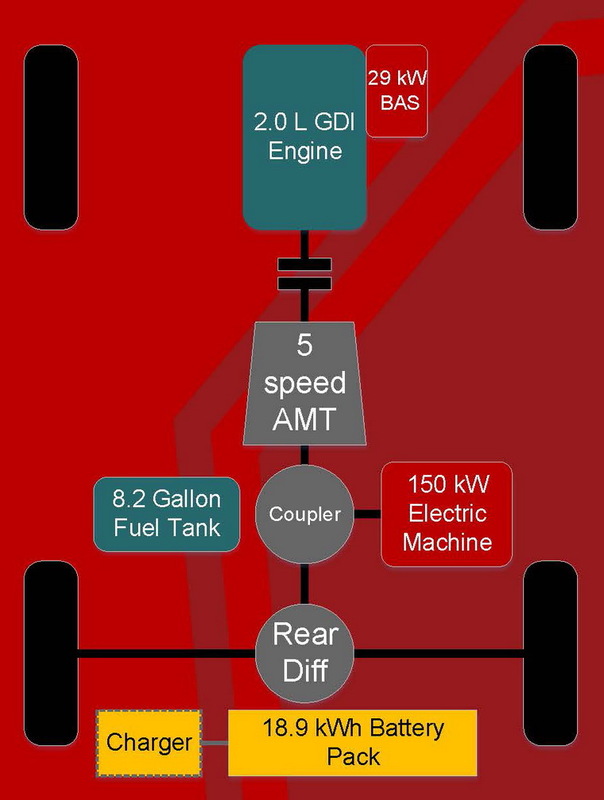 The OSU team developed a performance plug-in hybrid electrical vehicle (PHEV) by replacing the entire powertrain with an 18.9 kWh battery pack, P0 and P3 electric machines, a 2.0L, 4-cylinder engine, and an automated manual transmission (AMT) connecting the front powertrain (FPT) and rear powertrain (RPT). The AMT is a modified TREMEC T-5 five-speed manual transmission, with an automated shifting and clutching subassembly. The shifting subassembly consists of two electric motors that control the X and Y motion of the shifter. The clutching subassembly consists of a CAN controlled master and slave cylinder. The OSU team is made up of about 40 students, from freshmen all the way up to PhD students. The students come from a wide array of majors, from mechanical and electrical engineering to business and public relations studies. This variety helps augment the team’s capabilities and creative thinking with a diverse pool of educational and creative viewpoints. 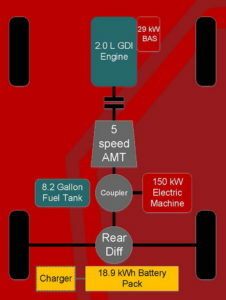 The unique nature of a PHEV with multiple torque producing components allows engineers to overcome the traditional deficiencies related to AMT’s. These deficiencies include launch control, torque holes during shifting, and re-engagement of the engine after a shift, all of which traditionally have kept AMT’s from large market penetration in the US due to negative effects on drive quality. “Automating a manual transmission provides several benefits over a conventional automatic transmission found in most vehicles today,” explains Greg Jankard, one of the team members dedicated to working on the transmission. “First, conventional automatics have parasitic losses associated with the torque converter and the shifting system that reduce their efficiency compared to manual transmissions. Second, manual transmissions are significantly lighter than conventional automatic transmissions and much smaller – meaning that they are easier to package in a vehicle. Both factors result in a more efficient transmission that translates to greater fuel economy for the consumer. 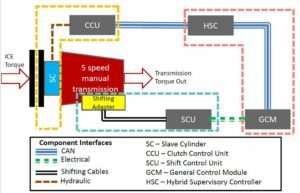 The solution for the manual transmission to fit the OSU EcoCAR project’s needs was the venerable TREMEC T-5 five-speed transmission. The transmission and conversion parts were supplied by TREMEC distributor Modern Driveline. Integrating the TREMEC T-5 into the OSU EcoCAR Camaro was handled by Aditya Modak (System Modeling and Simulation Lead Engineer), Simon Trask (Safety Systems Manager), and Greg Jankord (Controls System Lead Engineer). Together they worked on taking the T-5 and modifying it to become an automatically shifted manual unit. The conversion/development was not without its hurdles, as Jankord explains. The shifting subassembly has undergone several redesigns as the team learned more about the system. They had to replace the electric motors with improved units as gear teeth wore, and redesign the controls to improve the system and deal with nonlinearities in the system. While all the 16 teams are building hybrid Camaro’s, there are several different vehicle architectures within the competition, resulting in a varied and unique field of entries. Each team developed a different design which comes with certain benefits and drawbacks, and each team is trying to maximize their benefits while minimizing their drawbacks. For example, Virginia Tech put a bigger engine (going from a stock V6 to a V8) into their vehicle as well as electric motors. This gives them unquestionably more power than OSU’s architecture, but comes with potential drawbacks in efficiency if they are not able to implement certain fuel saving features such as cylinder deactivation. The University of Washington is going for a pure series vehicle – meaning that they have an engine which produces electricity for two electric motors in the rear of the vehicle that drive each of the wheels. 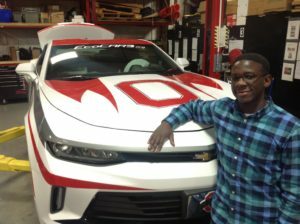 The Ohio State University team has topped the EcoCAR 3 competition for the past three years and is looking to defend its championship again in the final 2018 competition with its impressive 350 horsepower – yet eco-friendly – Camaro. EcoCAR 3 is a four-year collegiate engineering program that builds on the successful 26-year history of Department of Energy advanced vehicle technology competitions (AVTC) by giving engineering students the chance to design and build advanced vehicles that demonstrate leading-edge, eco-friendly automotive technologies. General Motors provides each of the 16 competing teams with a Chevrolet Camaro, as well as vehicle components, seed money, technical mentoring and operational support. The U.S. Department of Energy and its research and development facility, Argonne National Laboratory, provide competition management, team evaluation and logistical support. Through this important public/private partnership, EcoCAR 3 provides invaluable experience and training to promising young minds entering the North American job market.